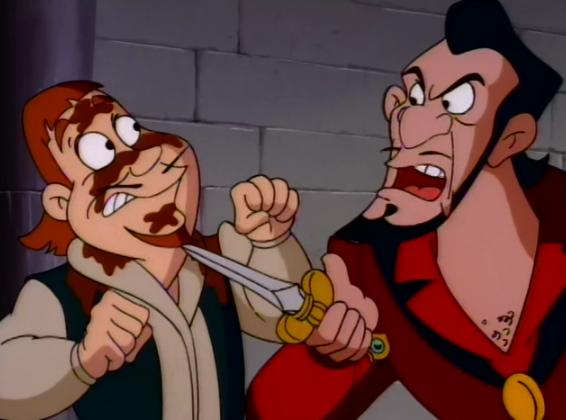 Most people say that this “Frollo” like Enchanted Tales in that he looks and acts more like Disney’s Gaston but I would disagree. 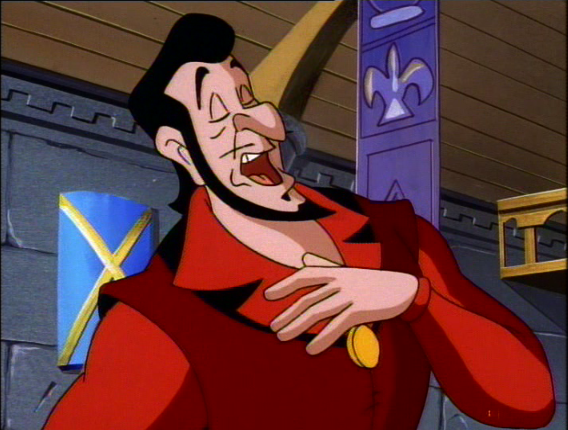 I think he’s like if Gaston and Jafar a la Disney had a love child and dumped him in a stupid Knock-off discount version of Paris. 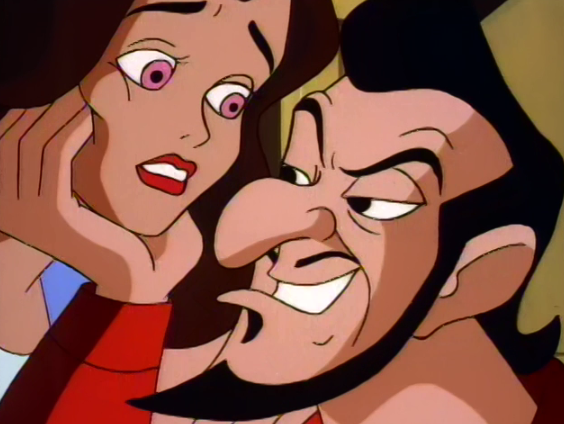 I mean his face is Jafar, he has his nose, and the body and clothes are all Gaston. He even has a little stupid minion. This doesn’t make him a convincing Frollo adaptation. 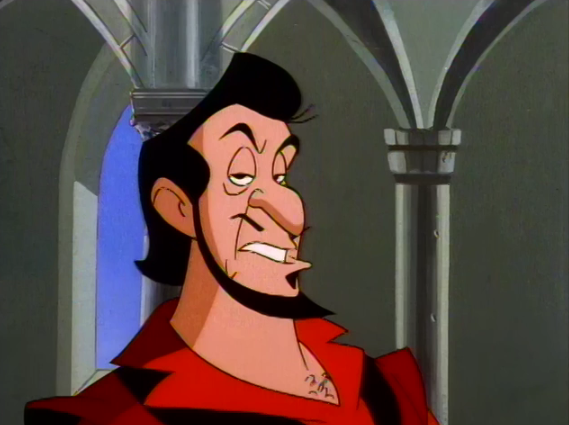 So let’s be clear with what we are dealing with here, in this “version” of Hunchback we have a knock-off version of a Gaston/Jafar hybrid named Frollo and not a knock-off version of Hunchback’s Frollo. 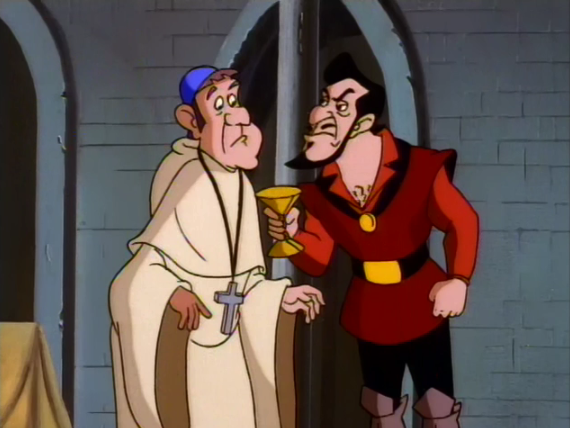 In this “version” Frollo is like a sheriff of Paris or something, which is funny because that is what the Enchanted Tales versions of Frollo was, so it’s like Knock-off inception here. 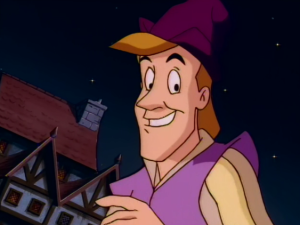 Basically all this Frollo wants, his entire motivation is that he wants Notre Dame’s money. Or rather he wants to exhort money from the Church, which is in the book as The Court of Miracles wants to rob the church when they rescue Esmeralda but I don’t think the makers of this movie made that connection, I’m not even sure they have seen a copy of the book, let alone read it. Does this make him bad in the movie? No sadly, he probably the most entertaining character mainly because he just reveals in his insidiousness and that makes him likable and relatable. Of Course him being the most entertaining of the characters speaks more to bore-feast of the rest of the characters than his level of being silly.